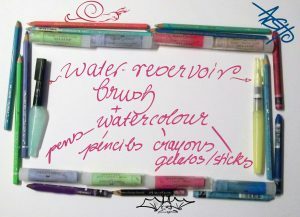 tip-to-tip: water-reservoir brush+watercolour crayons, sticks and co. 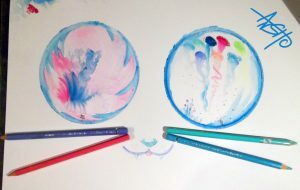 Instead of using watercolours in pans, you can use watercolour pencils, sticks/gelatos and crayons with a water-reservoir brush or stiffer regular brush, but in the way you would paint with pans. 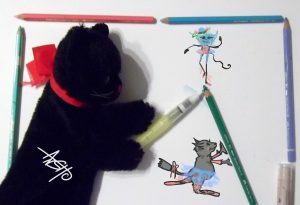 Tip-to-tip transfer: Brush over your water-soluble crayon/stick etc. 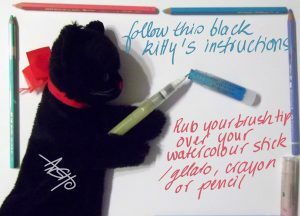 (use more strokes to intensify the colour) and then apply it onto the paper. 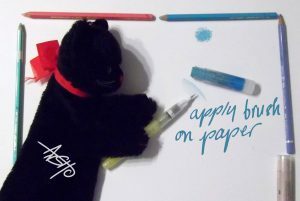 Alternatively draw with the crayon direcly on the edge of the paper or a separate paper and take the colour with the brush from there. 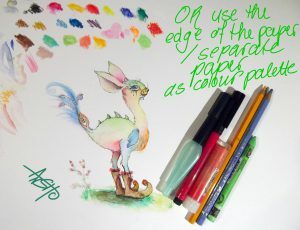 This way the colour application is much softer than drawing directly on the paper and going over the lines with a brush. You can colour a dainty little drawing or cover a DinA3 and larger paper with beautiful patterns. If you don’t have a watercolour travel pan set, you can always take your pencils, crayons etc. and a water-reservoir brush pen. There will be no spills, it does not take up too much space and you have double the use out of the pencils. Using them with the brush and also drawing details directly with them. 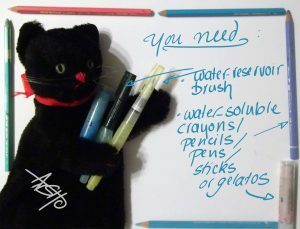 It is also something different to go over the crayon/pencil with a wet brush than immersing the whole crayon/pencil tip in water, which can damage the lead. 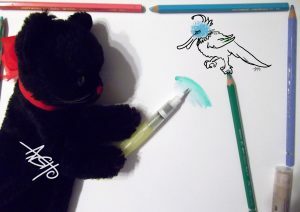 I also went over a Faber Castell Pitt Artist Brush Pen with the water-reservoir brush to take colour and transfer to the paper. After drying the colour is going nowhere, because of the waterproof ink used in the pens. Why would someone do this to an already brush shaped pen tip ? You can cover a bigger area this way than with the small, less flexible brush pen tip; you can gently glaze the paper and if your brush pens are older, you still get good use out of them without having to draw streaky (although I found it can make also nice effects). Painting on wet paper with the laden brush helps covering the paper surface quicker. Author AnshoPosted on 12. February 2018 16. 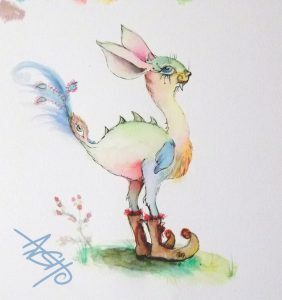 February 2018 Categories blog post, Brush Pen, Brushes, crayons, cruelty free, paper, pencils, pens, synthetic fibre, vegan, water reservoir brush, watercoloursTags brush nib, brushes, colour, Faber-Castell, gelatos, glazing, H2O Brush, hahnemühle, kuretake, lightfast, pan format, synthetic brushes, tip-to-tip, tip-to-tip transfer, water reservoir brush, water soluble pencils, water-soluble crayons, water-soluble sticks, watercolour, watercolour crayons, watercolour paper, watercolour pencils, watercolour sticks, watertank brush1 Comment on tip-to-tip: water-reservoir brush+watercolour crayons, sticks and co.